How to create ad campaigns. How to manage your campaign settings. At this point, we have worked with all the elements within Google AdWords and created the essential building blocks of an AdWords campaign. 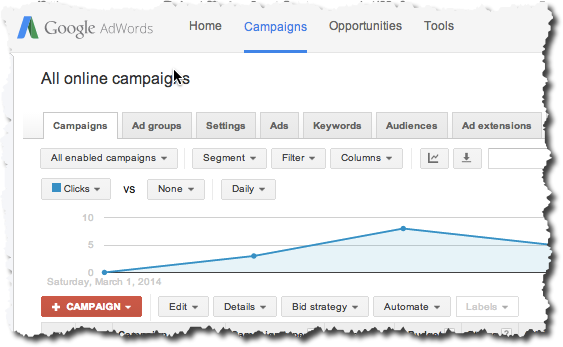 Now we will cover how you put them all together in your AdWords account. Step 1: If this is your first campaign, then you can click Create your first campaign button to start building your campaign. Provide a name for your campaign (e.g., Promote Services). Select the language your ad will be written in and the locations where you want your Ads to appear (location of potential customers). Select where you want your ad to appear. For this course, we want to select Google's search results. You have an option to select devices on which you want your ad to appear. For this course, use the default setting (i.e., All available devices). Enter the amount you're willing to spend on average each day for this ad campaign. Your budget will help determine how many times your ad can be shown each day. Click the Save and Continue button at the bottom of the page. 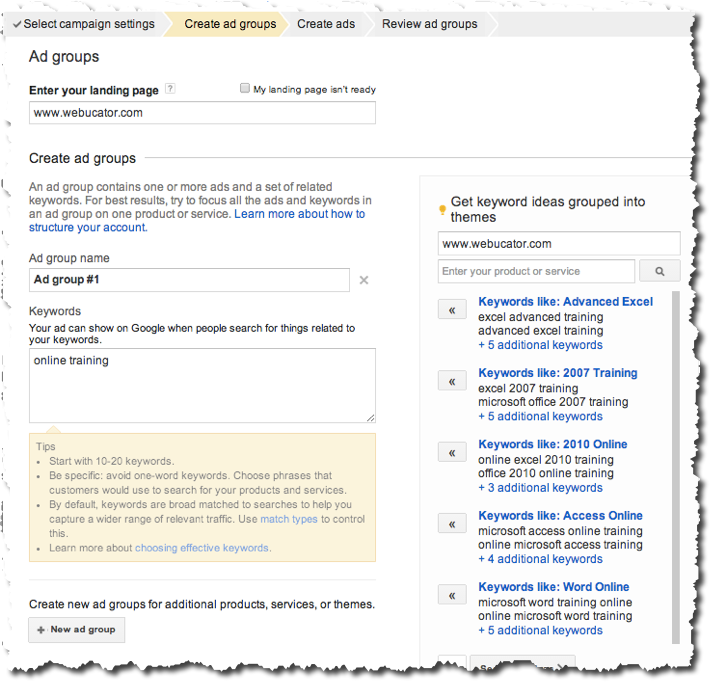 You can use AdGroups to organize your marketing initiatives. Provide a name to your AdGroup (e.g., Promote LED TVs). Select what kind of ad you would like to create. For this course, we will use Text ad option only. Provide Ad creative. Provide the list of keywords for this particular AdGroup. Enter the amount for your default bid. This is the maximum amount you're willing to pay each time a user clicks your ad. Click the Save ad group button at the bottom of the page. You are all set. Your ads should begin showing on Google shortly. To view your ads as they would appear on a regular Google search results page without accruing extra impressions in your account, you can use the Ad Preview and Diagnostics in the Tools tab. Create an ad campaigns for the the catering company and the bike store discussed in the previous chapter.If you were also thinking about your own business needs, please develop a draft campaign for your business as well. How to edit, pause, delete, or resume a campaign? Navigate to the Campaigns tab. Next to the campaign name, click the status icon and select the new status for that campaign (Enabled, Paused, or Deleted). 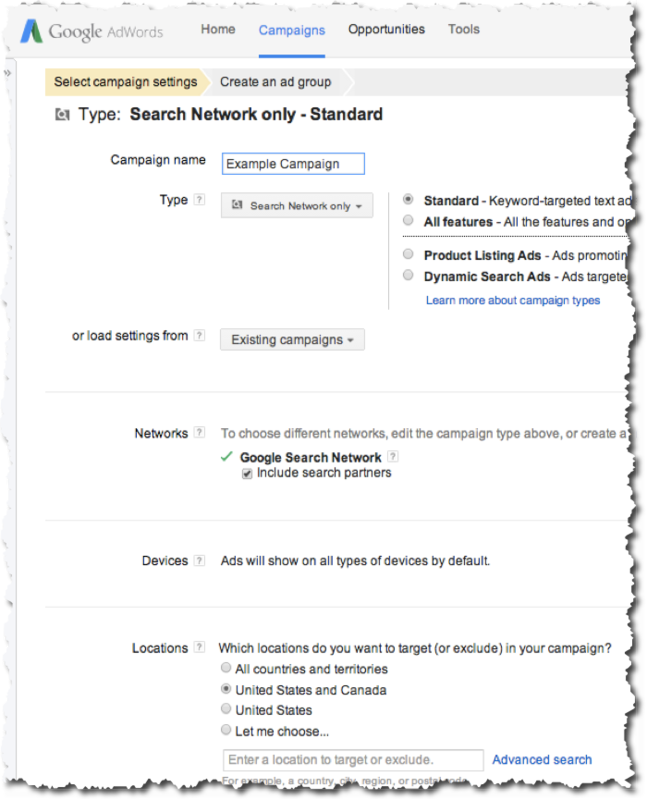 To change the status of multiple campaigns, select the check boxes next to the campaigns you want to update. In the Change status drop-down menu, select the new status. 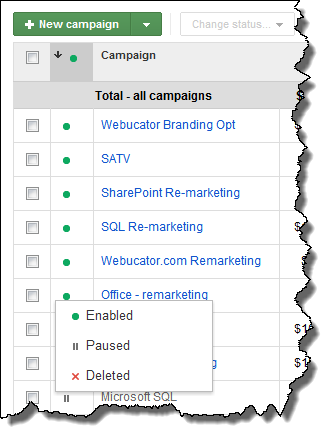 Note: If you only have one campaign in your account, you may pause or enable it, but not delete it.